If you enjoy camping by the beach but would like a few extra amenities, Peaceful Bay Caravan Park is the perfect place for you. There is a site for everyone in our 7 hectare Caravan Park. Choose from a large, grassed, open and sunny site or a more private, bushland cul-de-sac. Peaceful Bay is a magical and ancient seascape, where unique experiences are had and lifelong memories are made. We allow well behaved and friendly dogs at Peaceful Bay Caravan Park. There are no off-leash areas in the park and they must be kept on a leash at all times, cleaned up after and they cannot be left unattended in the caravan park at any time. Staff need to be advised of any dogs with you at the time of booking and dog owners are required to read and sign out dog policy on arrival. We have an excellent dog beach straight across from the caravan park but please be aware dogs are prohibited on the swimming beach and in all National Parks. 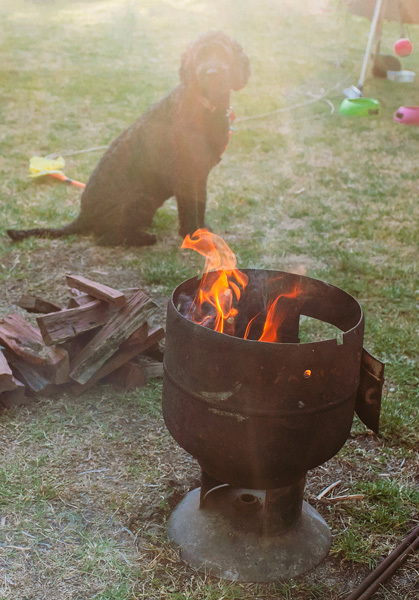 At Peaceful Bay Caravan Park we believe safe, contained campfires are a quintessential part of the camping experience. When you return to your camp after a day outdoors and dusk is drawing in, is there anything more magical than the glow of a campfire to see you through the evening? There are fixed concrete fire pits or you can bring your own brazier or fire drum as long as its raised off the grass and doesn’t damage the grounds. Bags of jarrah firewood are available from the shop. Please be aware fires are not permitted during high fire danger days. We can accommodate all sizes of Caravans, from a teardrop camper to a fifth wheeler. We have large grassed sites all with their own power and water hook ups and some sites with TV connectivity. The Peaceful Bay Caravan Park offers spacious powered and un-powered campsites. The relaxed layout of large, grassed sites, set among shady peppy trees is the perfect place for you to set up camp and unwind. Experience sitting around the camp fire roasting marshmallows with family and friends and enjoy the relaxed atmosphere. 4 night Minimum Booking $95/night for up to 6 people. Full payment at time of booking. There are only two working days between Easter & ANZAC Day 2019. Stay Easter/ANZAC week (7 nights) for $67 per night for up to 6 people.